ComplianceOnline, the leading GRC advisory network, and industry expert, Barry A. Friedman, will conduct a two day seminar on issues and solutions surrounding raw material requirements in a cGMP environment. ComplianceOnline today announced a seminar on Raw Material Requirements (Health Canada/USP/EP) in a cGMP Environment - Issues and Solutions. The two day seminar led by industry expert Barry A. Friedman will be held on February 12-13, 2018 in San Francisco, CA, May 7-8, 2018 in Boston, MA and September 21-22, 2018 in Chicago, IL. 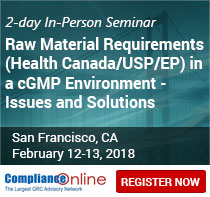 This interactive seminar will cover issues surrounding raw material requirements in a cGMP environment to ensure compliance with Health Canada, FDA, USP and EP regulations. Dr. Friedman will also host discussions on topics such as compendial vs. non-compendial testing, impact of raw materials in the timely production of a product, use of additional testing and much more. Case studies will be discussed to illustrate regulatory raw material issues. Seminar Instructor Dr. Barry Friedman is a Consultant in the Biotechnology, Regulatory Compliance and Aseptic Processing Arena. Dr. Friedman possesses over 30 years of industrial managerial experience in various aspects of biopharmaceuticals and medical devices to include regulatory compliance, expert witness testimony, GLP/GMP, quality control, auditing, sterility assurance, microbiological/analytical validations and fermentation technology. This course will be beneficial for quality, regulatory and compliance professionals, manufacturing engineers, quality engineers and auditors. Personnel in research and development, microbiology and documentation will also benefit from this training. “One of my colleagues referred me to this seminar. The subjects are well chosen and presenter is very knowledgeable. I liked the session on "ASQ Sampling, Supplier Change Notifications", said QC Sr. Specialist, Raw Material Support, Bayer HealthCare LLC, a seminar past attendee. “I like the info provided about "Vendor Qualification Requirements", said Senior Associate, Quality Assurance, Arbutus Biopharma Corporation, a seminar past attendee. ComplianceOnline is a leading provider of regulatory compliance trainings for companies and professionals in regulated industries. ComplianceOnline has successfully trained over 55,000 professionals from 15,000 companies to comply with the requirements of regulatory agencies. ComplianceOnline is headquartered in Palo Alto, California and can be reached at http://www.complianceonline.com. ComplianceOnline is a MetricStream portal. MetricStream (http://www.metricstream.com) is a market leader in Enterprise-wide Governance, Risk, Compliance (GRC) and Quality Management Solutions for global corporations.